I am eating a special organic green salad five days in a row now, all made with a chive vinaigrette made with my homemade chive flower vinegar. This is odd considering I don’t like anything resembling onions in my salad. When I was a little girl, my family switched the way they made green salad and started putting onions in it, to my horror, I might add. I would make them keep my salad separate. Onions can make me cry, and they did, but not how you think. They started lying to me and I would bite into my salad and taste the onion which led to tears. Why didn’t they understand that I hated raw onions, and I loved salad. I only use vinaigrette for salad and just like in childhood, I still eat a salad with every dinner. This means I have to find creative twists to not get into a salad rut. I know you do too, because this honey lemon salad dressing is always in my top ten ranking posts. Knowing how much just a little honey can do for a vinaigrette, I featured it in this recipe. A little goes a long way in helping the oil and vinaigrette bond together. I stumbled onto chive vinaigrette by sheer accident. I grew one chive plant last year and over the winter I saw it blossom and grow beautiful flowers. I didn’t know about chive flowers and when I talked about it on social media, someone sent me a link for making chive vinegar. I had no idea and I made the vinegar that very day using champagne vinegar as a base, but a white balsamic or a white wine vinegar works too. The recipe called for storing the vinegar with the flowers for two or three weeks, but I didn’t want to wait. My vinegar had enough chive flavor for me by the next day. The vinegar turned a beautiful color resembling soft pink tourmaline. 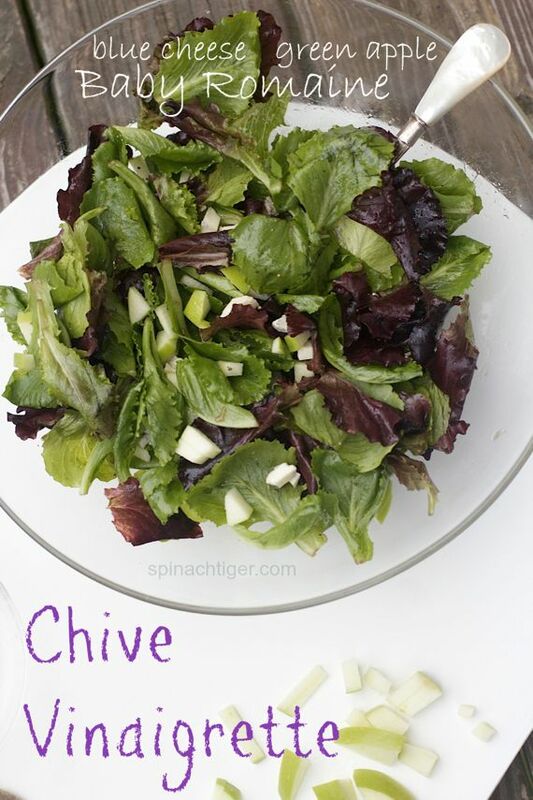 The chive flower vinegar became chive flower vinaigrette using only two other ingredients, honey and olive oil. So far, we’ve been eating this dressing for the past week, stored in a mason jar, and I’m loving it. It makes ordinary baby lettuce taste better with no additional ingredients, but it pairs really well with chopped green apple with cheddar or blue cheese. The bite of this vinaigrette would also complement beets in a salad. 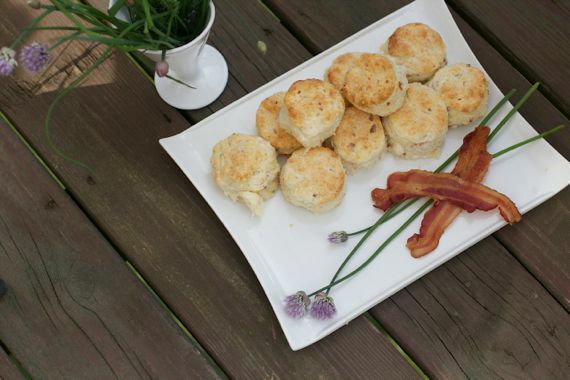 To further the chive experience, serve with these bacon cheddar chive biscuits. Wash chive flowers thoroughly, rinsing in cold water twice and drying. Bugs can easily hide inside the flowers, so wash well. Place flowers in mason jar. Fill up with vinegar. Store in dark place up to three weeks. I used the vinegar within two days and it had enough flavor and color. 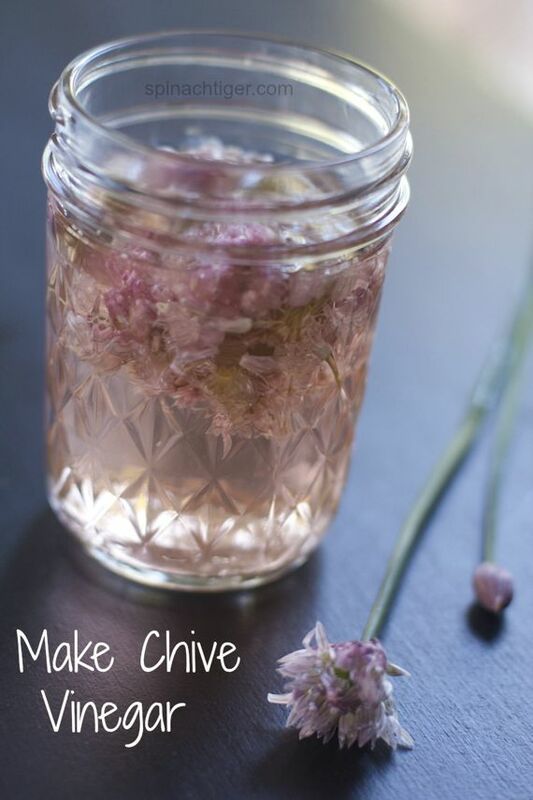 Shake chive flower vinegar with honey until thoroughly mixed. Stream in olive oil and mix well. Store in mason jar, not refrigerated. It will keep for several weeks. We getting nice information through this blog. It’s Greate and Very Helpful. What’s Heading down i am just new to this, I came across this I’ve discovered It positively useful and contains helped me out loads. This is such a fantastic recipe! 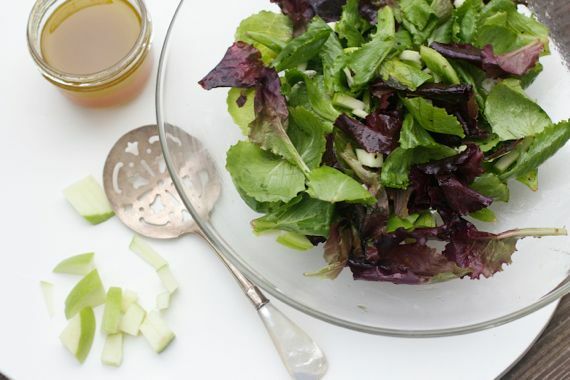 Now that salad season is here your vinaigrette would be a delicious addition. Thanks for sharing! Hi Angela! I’ve never cooked with chive flowers before, but we have some chives growing right now- looking forward to trying this recipe! Chive flower scones sound wonderful, too, Lora. Thank you so much for posting this. I inherited quite a large chive plant from the previous tenant of our NYC apt. and made scones out of the blossoms last year. They are just blooming again now and this is the perfect solution with what to do with them this year. It’s gorgeous. Would you share you recipe for the chive scones?